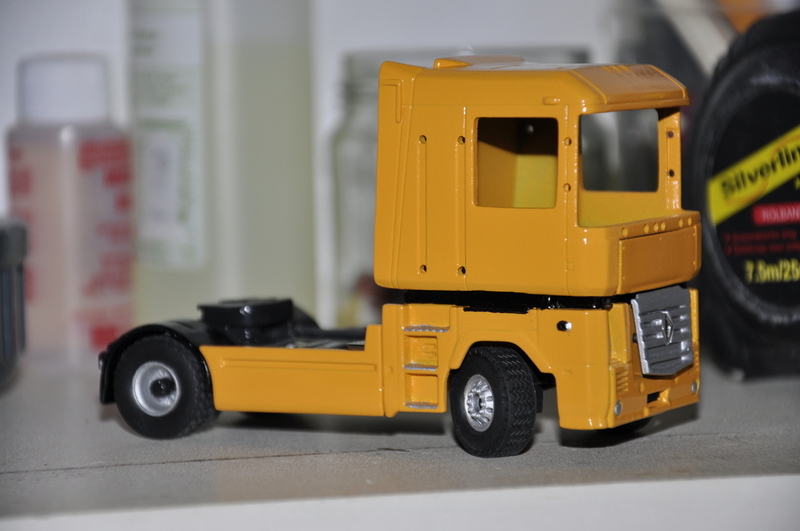 Any model vehicle collectors out there? 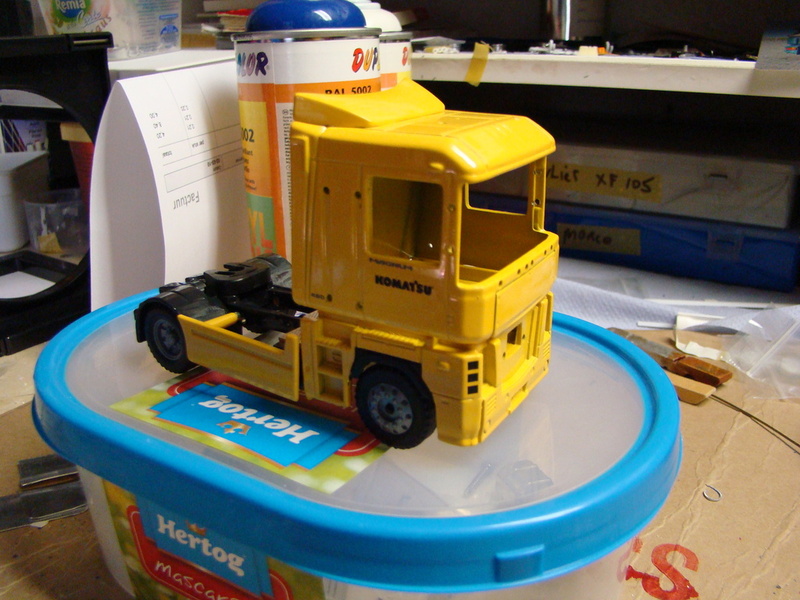 a Renault Magnum ,a manure truck,i bought a model of it i the komatsu livery,wesley take the trailer and i used the truck for the rebuild. 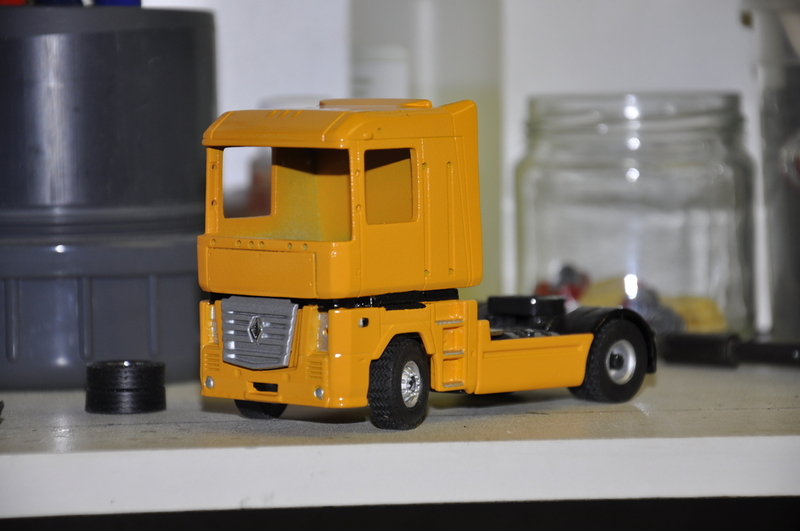 already stripped here but with the yellow paint stil on the model. 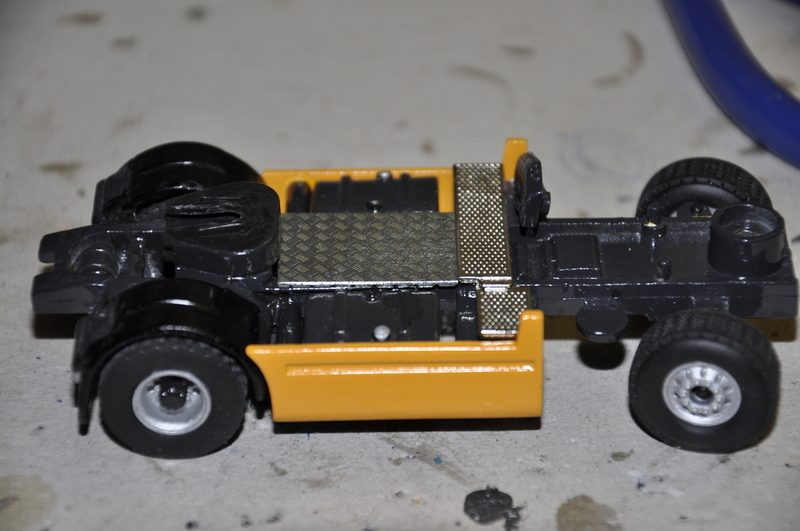 this is the same model as that i used for the manure truck. 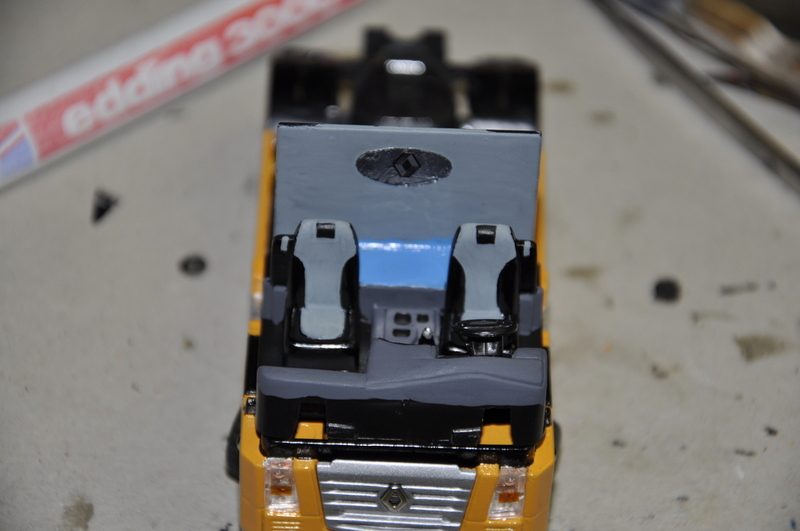 I guess that much of the skill lies in the masking and knowing in what order to apply the colours. Harald Jarl, Honningsvag to Svolvaer, Summer 1985. The first 5 days after the weekend are the toughest. 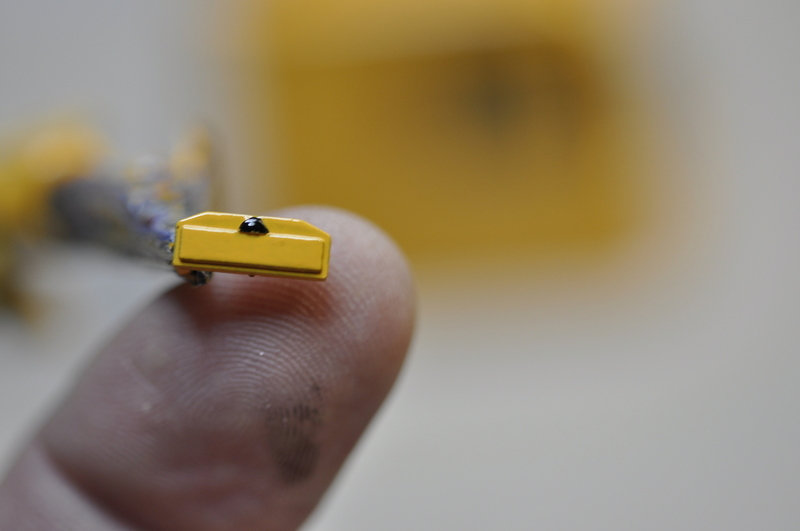 Did you use the wrong yellow for the cab by mistake, or as an undercoat, Thijs? Yes, Clipper, those cabs are very neatly parceled up to mask them, aren't they! yes ,you start painting with the lightest color and go to darker colors. 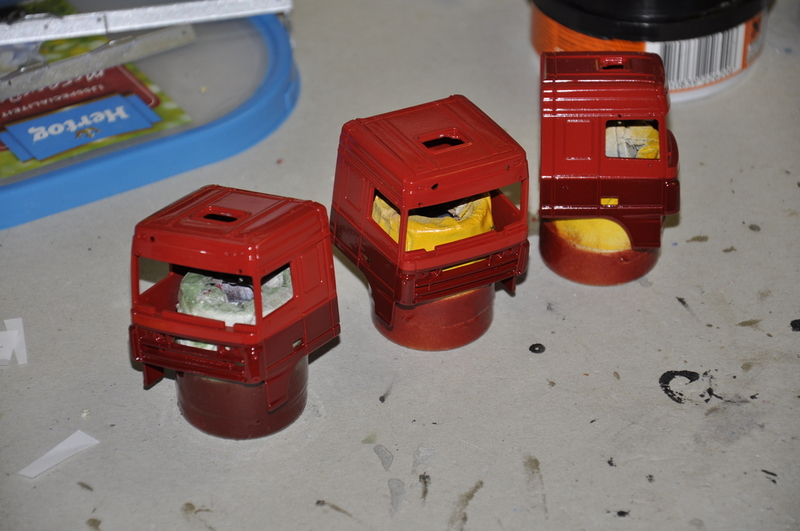 those are easy cabs,totally light red,mask everything that have to stay lightred ans spray the lower part with dark red and also the bumper part and the step part. but a lot of time goes in,the al the cabs wil look the same,so that the line on every can is the same. not by mistake ,but on purpose. the can i got of Kasteel Meeuwen wassn't a full one, it are small models so a lot of paint is passing the model. 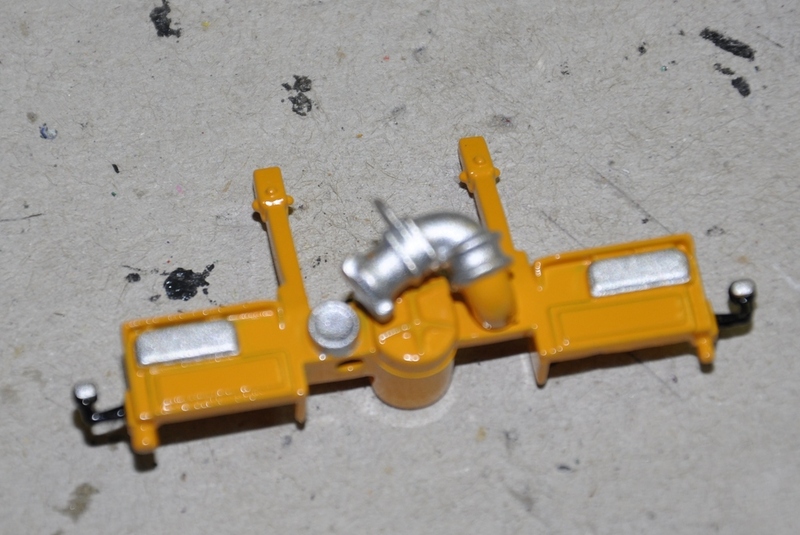 so using the wrong color (wich i have 2 cans of ,for a other model i made) i got me a right spray can yellow saving undercoat. now is this not the hardest color to spray as in a opaque layer???? red is by far the worst color. but you can't get a colored primer in a can,besides white,brown ,grey,so when i have to do bad colors i spray them with primer and even stil wet,a thin layer of the color,so i got me a kind of colored primer. 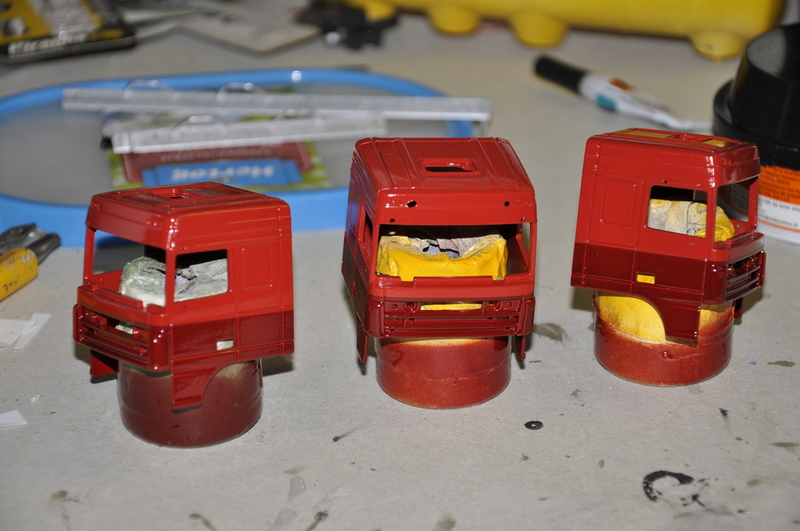 have sprayed them now several times,and removed the masking paper,but red is a awefull color to spray,you keep seeing those lightred on the cab lines. and this is what they would gonna look like. 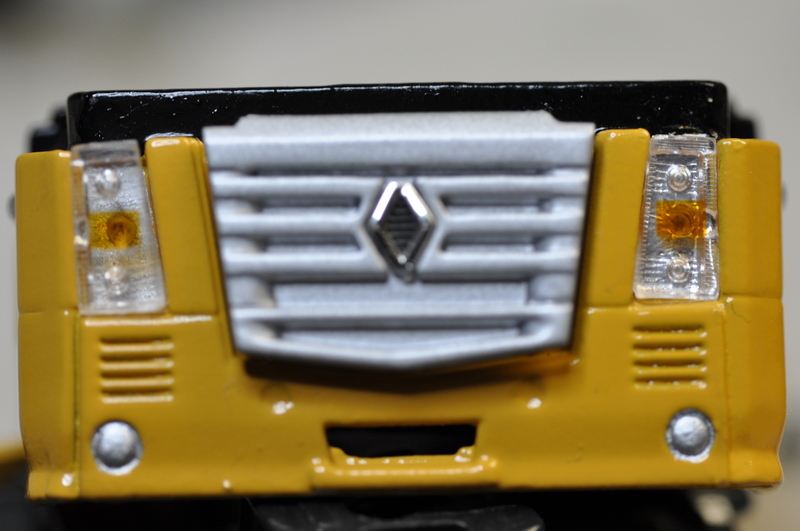 also painted the Renault cab in the right yellow color,bad kind of paint anyway,orangeapplepeel paint. 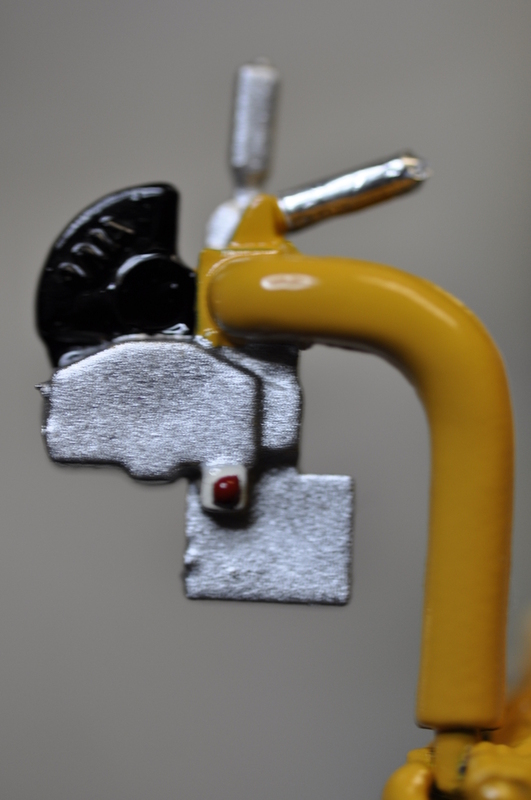 now al i have to do ,is spray the tank yellow,go to the firm for messuring the red lines and what color red it is. 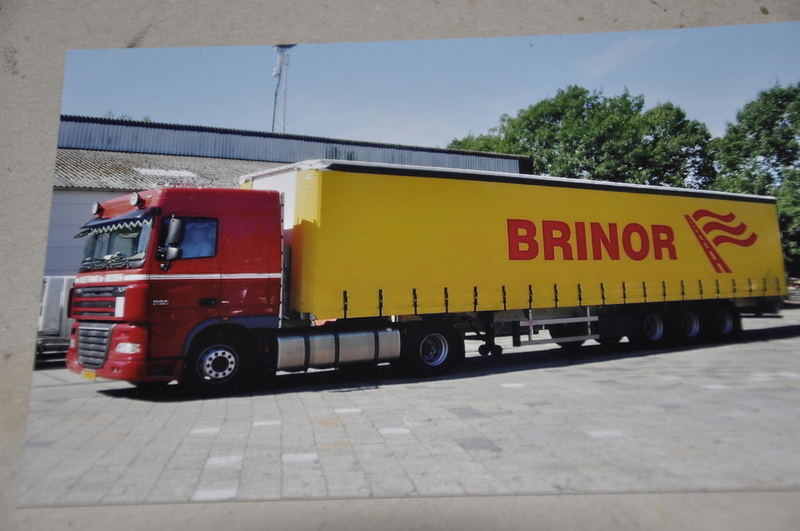 It's difficult to see in the photo of the actual Brinor truck which is light and which is dark red. It seems to be darker on the roof section, then on the side it seems lighter down to the white line, then mainly darker below. 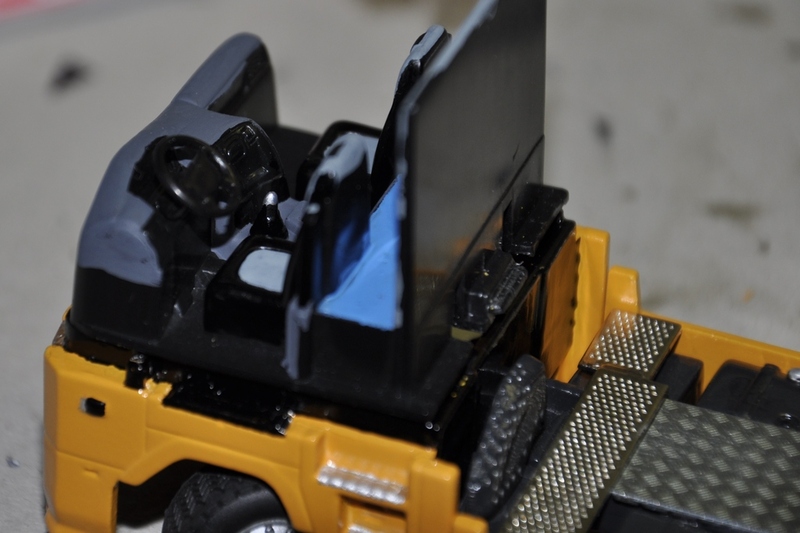 Yes, I saw that and also the difficulty with the pattern of ridges in the lower part of the first cab at #350.2, which seem to be lighter. 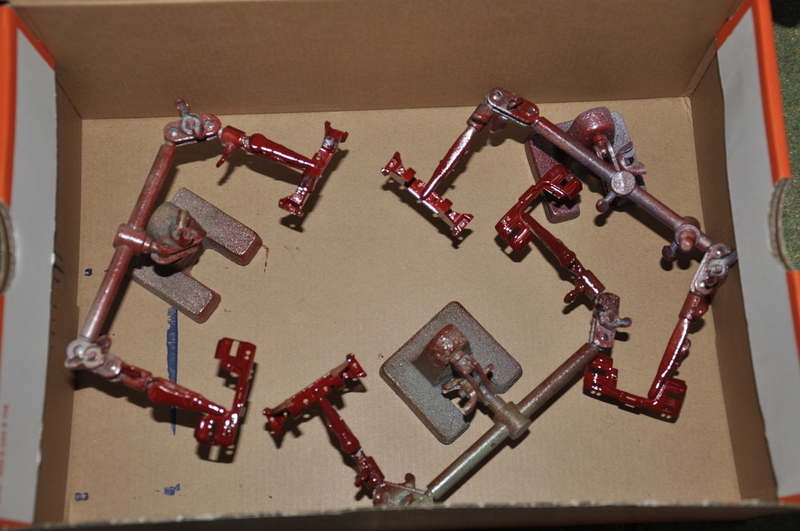 I thought that perhaps the dark red paint was not thick enought to hold but kept draining off the metal ridges. But it may just be a trick of the light catching them. 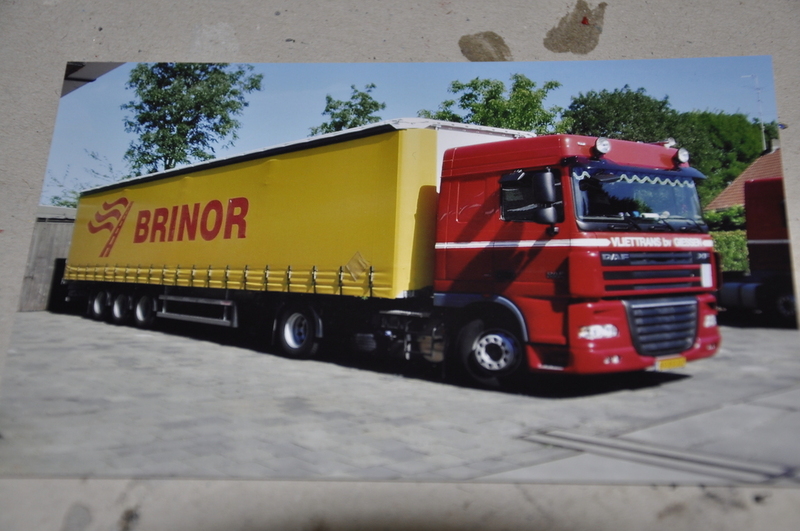 But in #353 I was talking about the whole side of the cab in the photo of the actual truck. Again, maybe it's the light, but it seemed as if the roof section of the side of the cab was darker than the section below down to the white line. 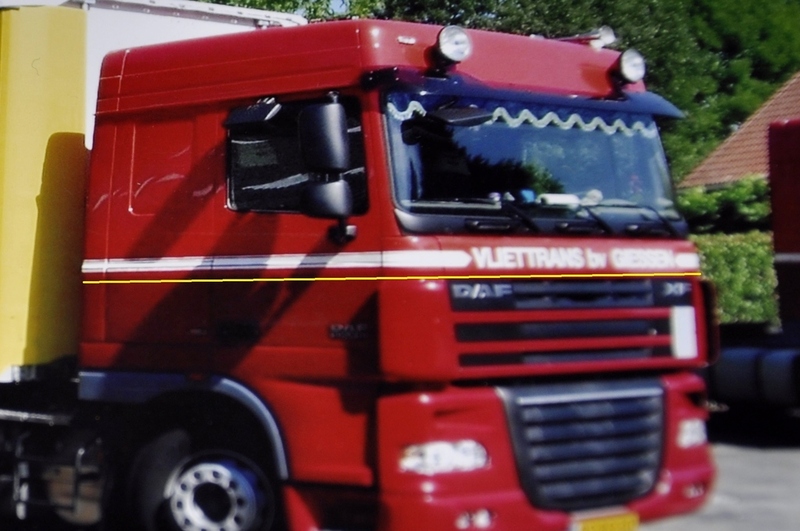 But you know the real truck and you have your models in front of you! It's probably all just the way the lighting falls, so that in the photos it looks different. i had painted the light reflectors chromesilver ,but remember me that i had aluminumtape,so here the left the painted light,right the alutape light. also placed the big piece of the catwalk. also made the interieur some better,sharper lines on the chairs and dashboard. 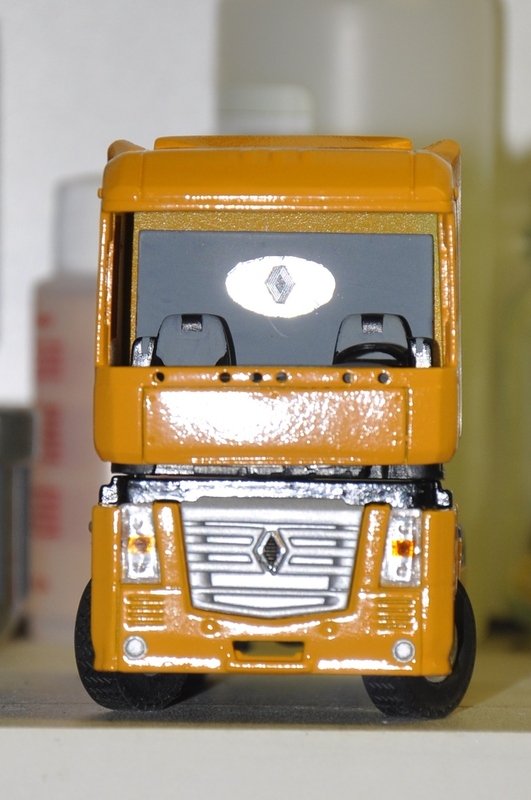 the Original truck didn't have a mirror on the backwal of the cab with the Renault logo,but it is what you can see oftern here in Europe. so every artist have some artistic freedoms,in this case i made a mirror here. 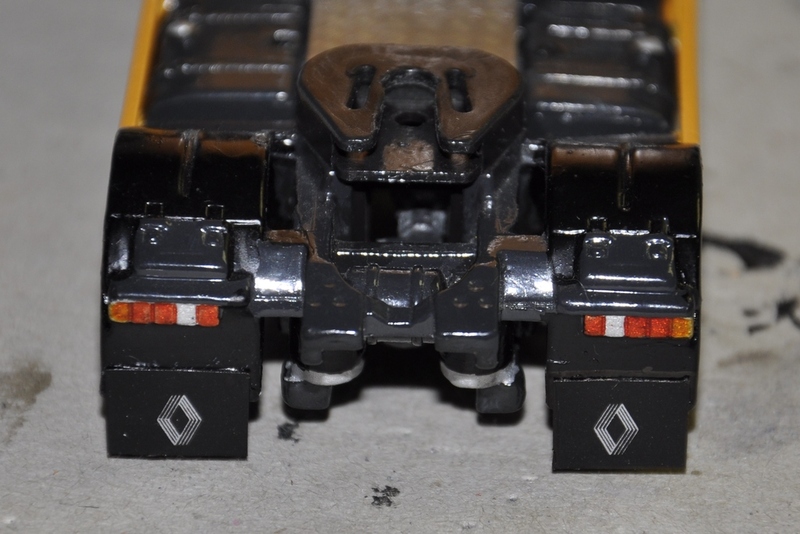 also painted the rear lights of the truck,and placed the mudflaps. the work at the slurry tank,was some little paintwork. 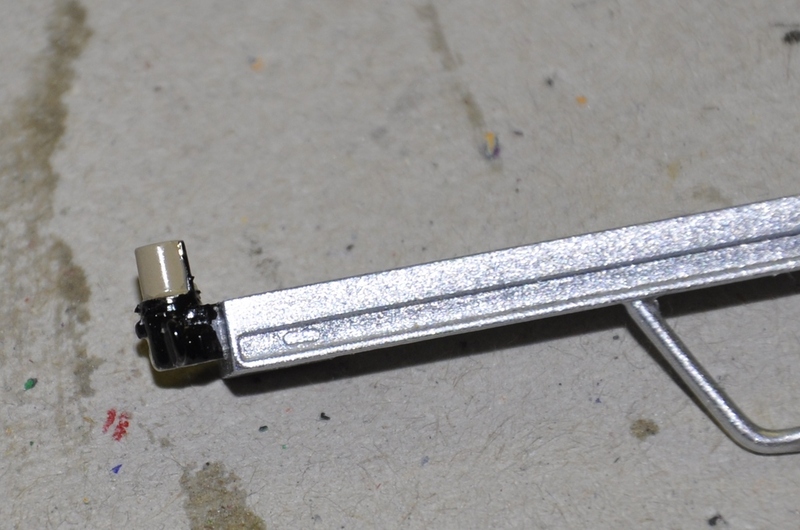 and painted the automatic grease system. All times are GMT+1. This page was generated at 06:57.